As reported by the SF Chronicle, killer African frogs are leaving a wake of death and destruction not seen since my NHL 95 days on the Sega Genesis. 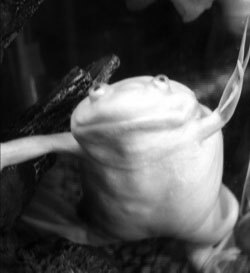 No one knows for sure when the African clawed frogs got into the pond or who put them there. But there they are, and the Toad Warriors have pretty much taken care of the native turtles, frogs and fish. “They’ve eaten everything they can get their mouths around, and now they’re eating each other,” said Eric Mills of the animal rights group Action for Animals. Mills worries that the fiendish amphibians — which grow to 5 inches in length and have claws on the toes of their oversize hind feet — may jump the pond and spread their reign of terror across other Bay Area waterways, although so far, none has popped up elsewhere. Are they the real deal or just another hyped “killer African” mania like those bees that apparently aren’t that “killer” and won’t migrate north of Texas? Recommendation: One look at this albino Grimace-looking killer gives an investor all the due diligence he or she needs to state unequivocally that these killer African frogs can produce killer returns. We recommend loading up on killer African frog LEAPS. A catalyst for hopping out of a a long position would be the moment “Killer Frogs” appear on the cover of Time Magazine. The Killer Amphibian sector is on fire right now. First, the Gators win the NCAA basketball championship. Second, the Gators win the BCS Championship. Now, Killer African Frogs. I think we’re seeing a bubble, here. Expect the top of the market to coincide roughly with the release of the new Teenage Mutant Ninja Turtle movie. Look for multiple contraction as investors begin to realize that growth is slowing. A truly aggressive trader, instead of just paying extra premium to buy LEAPs, would buy shorter-dated calls and start calling up his buddies at Time Magazine and feeding them the info they need to write a story on Killer African Frogs. If this trader was named Jim Cramer, he might follow up by bragging about it on the internet in order to draw the maximum ammount of attention possible from the SEC. you can put on the killer frogs trade without taking on any exposure to the killer amphibian sector. just take a short position in the gators in this year’s ncaa tournament (or, if youre more aggressive and willing to hold the beta, a long position in a non-killer amphibian competitor like a bruin, a buckeye or a jayhawk) and you’ve hedged out your exposure. To “thatotherguy” I choose not to buy your theory, because one must figure that regardless of what threatening or docile mammals or amphibians you choose, they can and will at some future point be knocked out of the market by a human-based acquirer. I’d suggest something more like a diversified spread of Tarheels, Commodores, Trojans, and Rebels. Humans are the top of the food chain, after all. Granted this did not bode well for the Volunteers but I’m still bullish on human mascots. Killer frogs? How about Killer Nuts? Buckeyes on a roll this year…. 2-pound frog the size of a small dog in Australia.